Comedy sequels rarely impress (exception to the rule: “A Shot in the Dark”), so a twenty-years-late sequel to “Dumb and Dumber” didn’t sound promising (especially after the terrible prequel “Dumb and Dumberer: When Harry Met Lloyd”). Yet it’s here all the same, reuniting stars Jim Carrey and Jeff Daniels with directors Peter and Bobby Farrelly. How funny could Carrey’s rubber-faced antics and Daniels’ deadpan stupidity be two decades later? Pretty damn funny, it seems. Early reviews aren’t exactly ecstatic, with even the most positive critics admitting that the film’s gags are hit-and-miss (the bit about the cat farting CGI feathers after eating a bird sounds dire), but the film throws so many gags at the screen and the stars are so committed to their characters’ bone-deep stupidity that the ones that hit really hit. Carrey in particular gets credit for turning the act of eating a hotdog into a bit of physical comedy that’s too marvelous to put into words (though a few critics try). Anyone in the mood for a healthy dose of intentional idiocy in the middle of Oscar season’s unintentional idiocy, look no further. “Dumb and Dumber To” hits theaters November 14. While there are parts in “Dumb and Dumber To” that will make you laugh so hard that you’ll be left breathless, simply too much time is left dedicated to both bad jokes and funny jokes that are allowed to overstay their welcome and ultimately implode. Read more. To be sure, there are some stellar bits in “To,” several of them containing Rob Riggle, who plays two roles in the film. But as opposed to the Farrellys’ best movies, where the jokes assault you from dozens of angles mercilessly, “To” gets bogged down in its so-so story and mediocre supporting characters. Read more. Harry and Lloyd charge into each social encounter like bulls in a china shop. Keeping matters fresh is the wide spectrum to their styles of idiocy. Sometimes one is clearly dumber than the other. Sometimes they are angry put-down artists. Then they swiftly pivot into full-blown morons, drinking embalming fluid believing it to be a slushie. Daniels gets most of his laughs from being loud and clumsy, but Jim Carrey is still a rubberfaced marvel. Read more. There’s a lot of dead time between inspired bits, but there are some pretty inspired bits, like a beautifully executed gag in which the heroes turn a bicycle-built-for-one into a bicycle-built-for-two, and some clever callbacks to the original film. But even at its best, the film plays like the comedy equivalent of a legacy act reuniting for a tour fueled more by nostalgia and goodwill than inspiration. Read more. There’s a scene halfway through the 20-years-later sequel to “Dumb and Dumber” where our doofus-anarchist heroes spot the doggy car from the first. They steal it for nostalgia’s sake, then immediately crash it. It’s almost as though directors Peter and Bobby Farrelly threw that in as a dare, to see if detractors would use it as an accidental admission that the thrill is gone, that you can’t go home again. 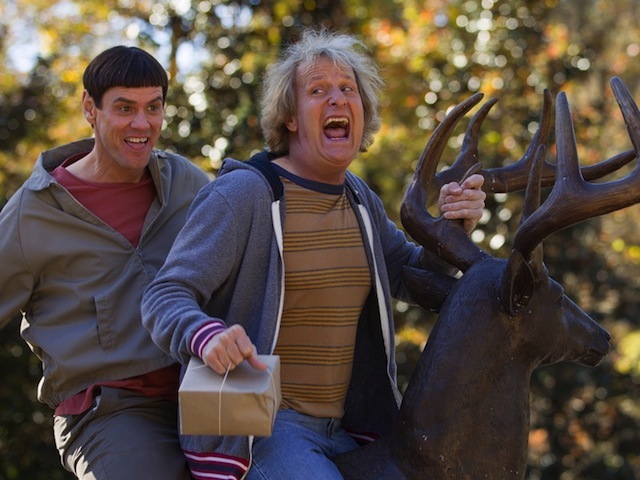 The thrill is gone — and yet “Dumb and Dumber To” is, if you settle into its own rapid-fire, hit-and-miss, lowest-common-denominator groove, a charming reunion, albeit one featuring an unprintable act on an old-timer in a nursing home. After all, the car crash bit can also be read as a beautifully timed gag. Read more. There sure are a handful of magnificently ridiculous comedic payoffs here: a fantasy sequence in which Harry offers helpful advice to his daughter upon the occasion of her womanhood; the fate of the lads’ infamous dog-decorated vehicle; a special forces agent emerging from unlikely camouflage. Yes, other jokes fall flat, or aren’t worth the gross or overly-involved set-ups. But by God, they will keep throwing those gags at the wall, and sooner or later, a few of them are going to stick. Read more. Much of the credit for that goes to Carrey and Daniels who remain almost pathologically committed to Harry and Lloyd’s stupidity. They possess the two crucial qualities for any physical comedian: fearlessness and shamelessness, and their hard work finds laughs even in the weaker material. (Carrey turns the simple act of eating a hot dog into a physical-comedy clinic.) Read more.